To Cite: Vand Rajabpour M, Yahyazadeh H, Beheshti M. Prognostic Factors and Survival of Glioblastoma Multiform (GBM) in Iranian Patients, Int J Cancer Manag. 2017 ; 10(4):e6260. doi: 10.5812/ijcm.6260. Background: Glioblastoma Multiform has been a common and fatal brain tumor. In this regard, there was ambiguity around patient survival rates in Iran que to data insufficiency. In this study, we have analyzed the overall and progression free survival in GBM patients at Milad Tehran hospital. Methods: In this retrospective study, we have considered survival, clinical characteristics and prognostic factors in 123 primary GBM patients who underwent surgical procedure (Biopsy or Resection) between February 2010 and June 2015 at Milad hospital, Tehran, Iran. All patients have pathologically proven as primary GBM. The overall survival and progression free survival has calculated using the Kaplan-Meier method. The Cox proportional hazards model has used for univariate analysis of prognostic factors. Age, gender, first symptom of the disease, tumor location and size, treatment protocol, and surgery have considered in the Cox model as prognostic factor. Results: One hundred and one patients have been studied. The mean age of the patients was 52.12 + 1.64, 67% of the patients were male, and 20% of the patients has not included in adjuvant therapy due to the patients low performance status after surgery. Patient median survival time was approximately 10.1 (6.3 - 11.8); 80% of the patient survive more than a month; and 57% of the patient has survived for six month, and one year survival of the patients was about 37%. Median progression free survival time was about 6.3 month, one-month progression free survival was 70%, and six months and one year progression free survival rates were 50% and 26%, respectively. Patients higher than 50 years have shown significant, 2 times more chance of death (HR = 2.00 CI 95% (1.3 - 3.2)) or disease progression (HR 1.94 CI 95% (1.3 - 3.2)). Correspondingly, patients who has not included in adjuvant therapy had 3.9 CI 95% ( 2.3 - 6.8) more hazard of death and 2.8 CI 95% (1.6 - 4.8) more chances of disease progression than who included in adjuvant therapy with TMZ and radiotherapy. Gender, symptom, tumor location or surgery type have not significantly affected patient prognosis. Conclusions: GBM patient’s survival would be quite poor. Nevertheless, this result was similar to the other reports from other centers and countries. Glioblastoma Multiform (GBM) is the most common and most aggressive primary brain tumor in adults that accounted for more than 50% of all malignant astrocytoma and usually presented in the sixth or seventh decade of life (1). Patients have generally exhibited poor prognosis with a median survival of less than 12 months (2). Surgical resection in addition to concomitant and adjuvant chemotherapy with Temozolomide (TMZ) in combination with radiotherapy (RT) was the choice of treatment for these GMB patients (2, 3). Surgical resection and residual tumor (4-6), age, patient’s preoperative Karnofsky Performance Scores (KPS), tumor location, postoperative radiotherapy (RT), and Chemotherapy (CT) (5, 7, 8) have known prognostic factors of GBM patients (1, 6-8). There were few evidences about the survival and prognostic factor of GBM patients in the Islamic Republic of Iran. The most recent and important study was from Namazi hospital Shiraz by Ahmadloo et al. (9) in which they have considered 223 patients between 1999 to 2008. 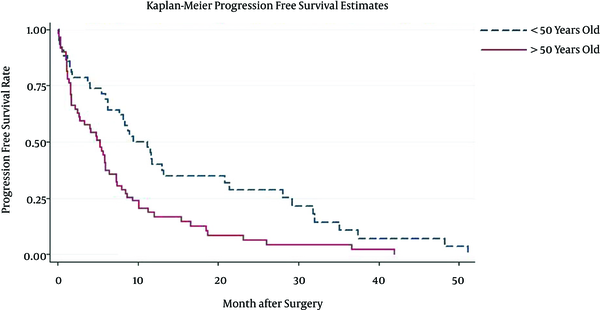 According to their findings, the median progression free- and overall survival were six and 11 months, respectively, and radiation dose, extent of surgical resection, and adjuvant chemotherapy were independent prognostic factors for overall survival. Radiotherapy and Temozolomide (TMZ) protocol for GBM have played a major role for improving patient outcomes. The first studies on this treatment protocol have begun in 2005 by Phase III randomized trial (2, 10). Thus, in the study by Ahmadloo et al. many of the patients have treated by Nitrosourea based chemotherapy and few (21/223) have treated with TMZ. Therefore, we have thought a survival study was essential to evaluate the current situation in recent years. In this study, we have analyzed the survival and prognostic factors of GBM patient in a Tertiary non-academic center. We have studied 123 GBM patients; we have considered the overall and progression free survival, clinical characteristics, and prognostic factors retrospectively. All GBM patients who underwent a surgical procedure (biopsy or resection) between February 2010 and June 2015 in Neurosurgery ward of Milad hospital, Tehran, Iran (tertiary governmental non-academic hospital) admitted to the study. Only patients with a pathologically proven primary GBM have included in the study. Patients with secondary GBM or history of previous Astrocytoma have excluded. We have used patient medical reports for collecting the necessary data and subsequently followed-up the patients by calling them using the contact information provided in their medical files. Tumor size has determined according to the patient’s pathology report. Progression time has determined according to the report of required second surgery, or change in the treatment protocol, or need for second admission. We could not follow up 22 patients and they excluded due to loss of follow-up. Patients have undergone surgery, taking either a tumor biopsy (n = 6), partial or complete tumor resection (more than 70% surgical resection) (n = 95) prior to adjuvant therapy .Sixty five patients have received six weeks of concomitant RT/TMZ therapy as primary treatment. They have received TMZ 75 mg/m2/day plus RT at a dose of 60 Gy to the planning target volume in 30 - 32 fractions with five fractions/week which delivered by a megavoltage linear accelerator. Ten patients have undergone Nitrosourea-based chemotherapy and Radiation therapy. They have received a median of four (range 1 - 6) cycles of Nitrosourea-based chemotherapy consisting of Procarbazine, Lomustine, and Vincristine (PCV regimen) in addition to field radiotherapy with a dose of 60 Gy in 10 fractions. Six patients have undergone radiotherapy without adjuvant chemotherapy. Twenty patients have not received adjuvant therapy due to poor conditions after surgery. 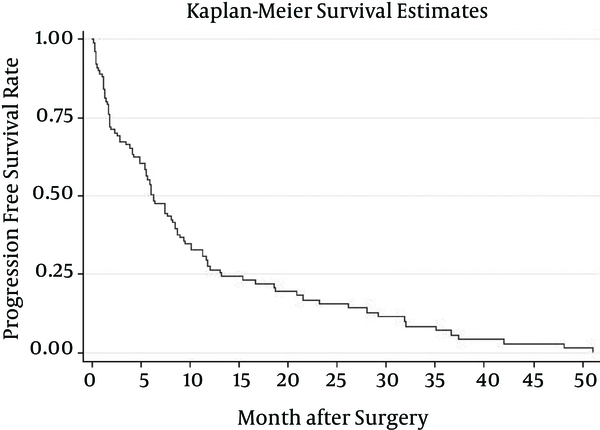 Overall Survival duration has calculated from date of surgery to date of death and progression free survival estimated from date of surgery to date of disease progression. Data on patients who were alive at the end of the study has censored from survival analysis. Statistical analysis has carried out using Stata software, Version 13.0. Overall survival and progression free survival has calculated using the Kaplan-Meier method. The Cox proportional hazards model has used for univariate analysis of prognostic factors. Death was a outcome for cox model for estimating the prognostic effects of variables related to overall survival (OS). Death or disease progression were outcome in cox model for calculating the hazard ratio of prognostic factors on Progression Free Survival (PFS). All procedures and methods were in accordance with the national ethical standards involving human subjects and in accordance with the Helsinki Declaration of 1964, and later versions. The study has conducted after approval of the ethics committee of Iran University of Medical Sciences. All patients have provided a general informed consent form upon admission to the hospitals and approved of usage of their data in medical research. Because this study has used the archived material of patients who have admitted to the hospital in previous years, the ethics committee has waived the condition of obtaining additional informed consent from the patients. We have studied 101 GBM patients; we have followed-up the patients for median time of 31.9 month (95% CI (26.5 - 39.5)). Forty-two percent of patients were aged than 50 years old (Table 1) and the mean age of the patients was 52.12 ± 1.64 (Table 2). Sixty seven percent of the patients were male and 67% of patients has described headache as a first sign of their disease. Tumor has involved one lobe of the brain in 68% of the studied patients; 20% of the patients had a frontal lobe tumor, and 34% had the tumor in both lobes of the brain. Six patients have undergone biopsy and the rest received surgical resection (more than 70% resection). Sixty five patients have received concurrent TMZ and Radiotherapy treatment; ten patients have received Nitrosourea based chemotherapy; six of them only received radiation therapy, and 20 of the patients have not included in adjuvant therapy due to poor medical conditions after surgery. Almost half of the tumors were smaller than 5 cm (Table 1), and mean tumor size was 8.63 ± 2.01 (Table 2). Patient median survival time was approximately 10.1(6.3 - 11.8); 80% of the patients have survived more than a month; 57% survived for six months; one year survival of the patients was about 37%, and 22% of the patients survived more than two years (Figure 1). Patients younger than 50 have demonstrated a much better chance of survival and their median survival was about 10.9. Patients who have undergone biopsy and patients included in Nitrosourea based chemotherapy had better survival outcomes with more than 12 months of median survival (Table 3) (Figures 2 and 3). Median progression free survival time was approximately 6.3 months; one month progression free survival was 70%; and six months and one year progression free survival rate were 50% and 26%, respectively (Table 4) (Figures 4 - 6). In Univariate Cox Regression Analysis, patients with more than 50 years of age exhibited a significant two times more chance of death (HR = 2.00 CI 95% (1.3 - 3.2)) or progression (HR 1.94 CI 95% (1.3 - 3.2)). Correspondingly, patients who have not included in adjuvant therapy had a 3.9 CI 95% ( 2.3 - 6.8) higher hazard of death and 2.8 CI 95% (1.6 - 4.8) higher chance of disease progression than those included in adjuvant therapy with TMZ and radiotherapy. Gender, first symptom, tumor location or surgery type has not significantly affected patient prognosis (Table 5). Glioblastoma Multiform have been among the most deadly neoplasms and continued to be incurable and universally fatal diseases (11). In this study, we have analyzed patient overall survival, progression free survival, and related prognostic factors. To the best of our knowledge, it was a first report about Iranian GBM patients’ survival that included adjuvant therapy by TMZ and Radiation therapy. In former studies by Ahmadloo et al. (9), the majority of patients have treated by Nitrosourea based chemotherapy. According to our findings, patient survival was quite poor. Almost 20% of the patients could not be included in adjuvant therapy (due to poor conditions after surgery). More than 20% of the patients have survived less than one month and patient median overall survival has estimated at approximately 10.3 months (Table 3). 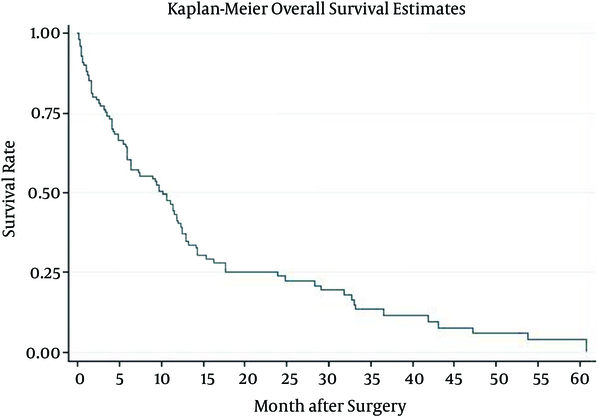 Thirty percent of the patients have experienced death or relapse within one month after surgery, and patients’ median progression free survival was about 6.3 months (Table 3). We have found a similar result with Ahmadloo et al. (9) about the GBM survival in Iran. In their report, a median survival of about 11 months and median progression free survival of about six months has reported. A slightly worse outcome in our patients could be related to higher frequency of patients with poor post-operative conditions (who have not included in adjuvant therapy). According to the literature review from Ahmadloo et al. (9), the median overall survival time in 11152 patients was 9.2 months (in more than 25 survival studies considering studies from different regions) and median progression free survival rate has estimated to be about 5.9 months in 1201 patients in four studies (9). Kumar et al. (12) in a survival analysis of 439 Indian patients from 2002 to 2009 has found a median survival time of about 6.33 months, which was less than the statistics reported by studies in Iran. Ekici et al. (13) in a survival study from Turkey between 2000 to 2006 has reported a median survival time of about 12 months. Studies from developed countries also reported poor prognosis for GMB patients. Based on population based outcome data over a twenty–year period from Alberta Brain tumor registry, of 689 glioblastoma patients, only 2% have survived three years or longer (11). In the study that has included 766 patients from Duke University, only 32 patients has survived five of more years (14). In another study from the Memorial Sloan-Kettering database, 39 patients from 352 patients have lived after three years (15). In summary, GBM patient survival would be generally poor, and median survival and progression free survival was similar in different studies, and according to our evaluation, patients in Iran and Milad hospital had similar outcomes to patients in other treatment centers and countries. In our study, patients older than 50 years exhibited two times more hazard of death or disease progression, and patients who have not included in adjuvant therapy had a significantly lower prognosis HR 3.97 CI95 (0.7 - 1.5) (P value = 0.02). There was a lot of consistent data about the prognosis effect of the age (8, 9, 11); younger patients had better outcome for aggressive treatment, and malign astrocytoma was less frequent in this patients. Patient who have not included in adjuvant therapy regimens have shown significantly lower survival and poorer prognosis (HR 3.94 95% CI (2.3 - 6.8)) P value = 0.02) (Table 6). There was a proofed result about the prognostic effect of treatment in GBM patients (3, 10); but observed difference has related to the bias in information about the patients general condition before and after surgery status. Patients who have not included in adjuvant therapy had worse condition median Survival of this group of the patients is about 1.7 months, and only one patient in this group has survived for one year. In conclusion, GBM patients’ survival was quiet poor in our hospital. However, the result has been similar to other reports by other centers and countries. Patient age at diagnosis was the main prognostic factor of GBM patients in this study. This research has supported by Iran National Social Security organization.